If your child receives special education services, he must have an Individualized Education Program (IEP). It spells out your child’s learning needs, the services the school will provide and how progress will be measured. Several people, including parents, are involved in creating the document. The entire process can be a great way to sort out your child’s strengths and weaknesses. Working on the IEP can help you figure out ways to help him succeed in school. An IEP is intended to help children reach educational goals more easily than they otherwise would. In all cases the IEP must be tailored to the individual student’s needs as identified by the IEP evaluation process, and must especially help teachers and related service providers (such as paraprofessional educators) understand the student’s disability and how the disability affects the learning process. The IEP is meant to ensure that students receive an appropriate placement, not only special education classrooms or special schools. It is meant to give the student a chance to participate in regular school culture and academics as much as is possible for that individual student. In this way, the student is able to have specialized assistance only when such assistance is absolutely necessary, and otherwise maintains the freedom to interact with and participate in the activities of his or her more general school peers. Why is it important to have an IEP? The IEP creates an opportunity for teachers, parents, school administrators, related services personnel and students (when appropriate) to work together to improve educational results for children with disabilities. The IEP is the cornerstone of a quality education for each child with a disability. How often do IEPs need to be reviewed? 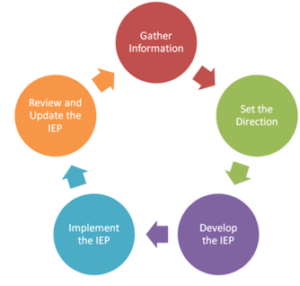 The child’s IEP is reviewed by the IEP team at least once a year, or more often if the parents or school ask for a review. If necessary, the IEP is revised. Parents, as team members, must be invited to attend these meetings.